Gloria Guity, right, evacuated to Miami Edison Senior High School with her children Nelly and José during Hurricane Irma. Nelly and José have cerebral palsy, and for the three nights at the shelter, Guity, 76, was their only caretaker. Guity’s children — 38-year-old Nelly and 32-year-old José — have cerebral palsy. Nelly relies on a walker and José uses a wheelchair; both have intellectual disabilities. An older brother, a bus and an Uber driver took the family from their home near Golden Glades to a series of shelters, none of which were equipped for people with medical conditions. With rain from Irma’s outer bands beginning to dampen the pavement outside the school, Gloria, Nelly and José were stuck at Edison. “Está bien,” Gloria said, shrugging. It’s OK. It was OK because it had to be: the Guitys didn’t have a way to leave and Edison at least offered power, some food, water and a safe place to ride out the storm. Staff were doing what they could to help the family. 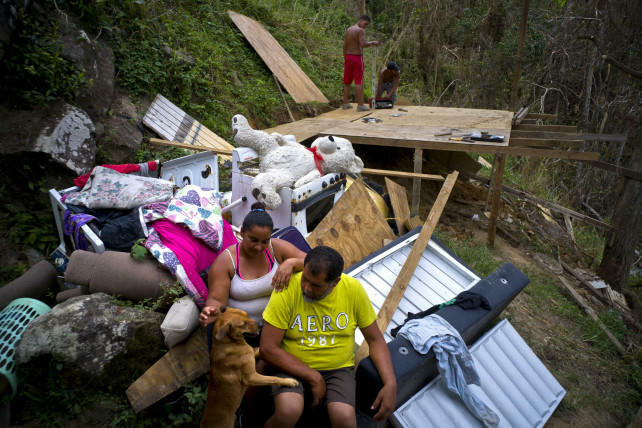 But the uncomfortable and often unsafe conditions the Guitys and thousands of others experienced during Irma highlight the need for Miami-Dade to improve planning, communications and support for medically vulnerable evacuees during emergencies. The Guitys were among about 480 people who ended up at Miami Edison before and during the hurricane, whose worst effects swept through South Florida on Sunday, Sept. 10. Many of the people taking shelter were elderly or wheelchair-bound, but unless they brought their own mattress or cot, they spent nights sleeping on benches or in chairs - or on the school’s red tile floor. Edison didn’t have cots or blankets, and there were no nurses, doctors or aides. Ambulances came to the shelter at least five times -- including to evaluate a woman who said she'd been sent to the shelter from a hospital via taxi but was experiencing confusion and had been separated from her family. Miami Edison opened as a general population hurricane shelter during Hurricane Irma. Under Miami-Dade's emergency management plan, those shelters don't provide cots. Some special needs shelters do, as well as emergency centers that openafter hurricanes. “Unbelievable,” said Anthony Whitfield, who was at the check-in desk during the height of the storm that Sunday afternoon. Whitfield wasn’t there in an official capacity — he works with senior citizens and said he came to Edison when several of “his” seniors decided to evacuate. He said he’d worked at inner-city shelters during hurricanes Katrina and Sandy, and decided to stay with the evacuees at Edison because he was worried about the people there. “I just can’t stand it when a senior citizen has to sleep on the hard floor,” Whitfield said. 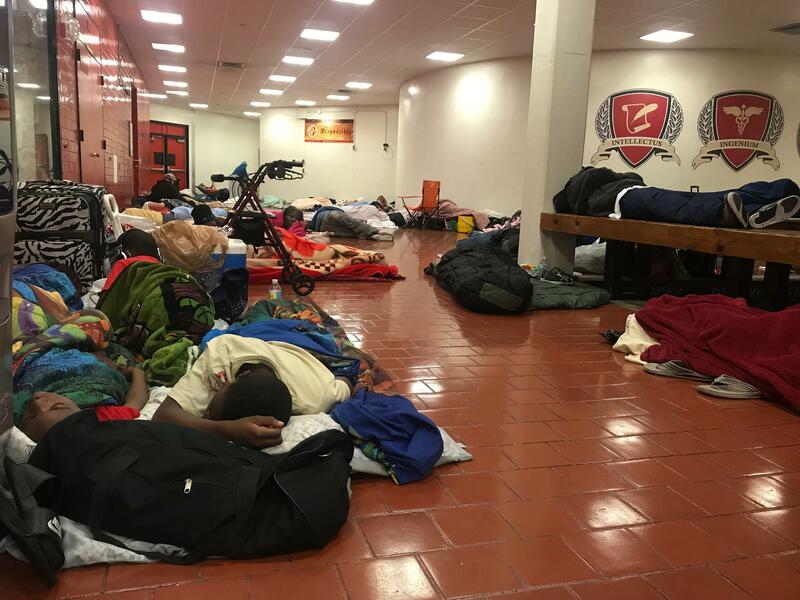 Staffing the shelter in an official capacity were employees from Miami-Dade County, police officers and National Guardsmen, as well as principals, security guards and kitchen and custodial staff from Miami-Dade County Public Schools. Those approached by WLRN declined to be interviewed. Sitting at the desk next to two county employees, Whitfield said one evacuee had attempted suicide by taking pills. He said because of high winds, rescue workers couldn’t transport the man to a hospital. Instead, they stayed with him in the principal’s office, monitoring his condition. “This is bad times for a lot of people, where they just can’t take no more,” Whitfield said. Soon after — just as the storm reached its peak in Miami — many people who’d driven themselves to the shelter began leaving en masse. People without cars were offering them money for rides. Edison wasn’t supposed to be sheltering people who are elderly and medically vulnerable, according to the county emergency management department. 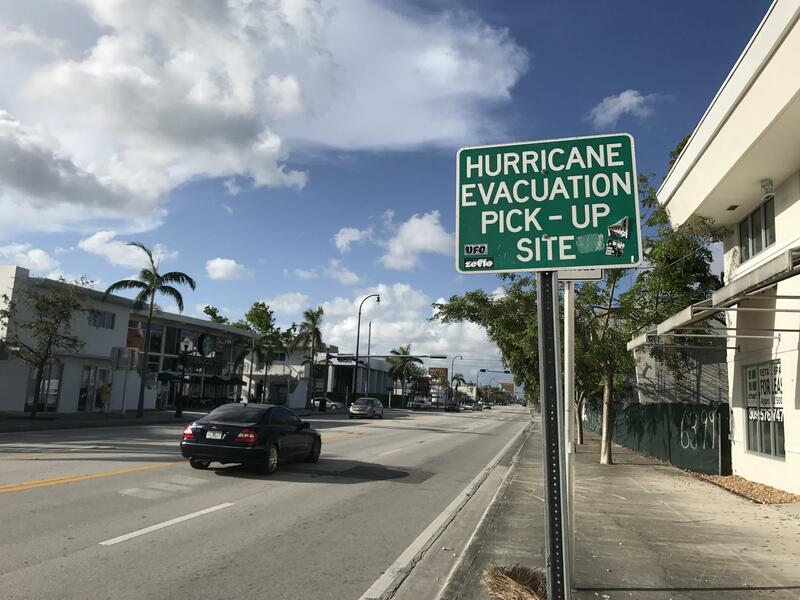 Curt Sommerhoff, Miami-Dade’s emergency management director, said Edison was opened as a general population shelter, and — as at all county general population hurricane shelters — cots and even paramedics aren’t guaranteed. He said it’s not yet clear why so many elderly, disabled and medically vulnerable people ended up at Edison. Before hurricanes, shuttle buses operated by Miami-Dade County take evacuees to shelters from stops like this one on Biscayne Boulevard near Northeast 64th Street. The county has an Emergency Evacuation Assistance program in which medically vulnerable people are supposed to enroll well before hurricanes hit. Sommerhoff says emergency managers get the word out through home health care providers and the Florida Department of Health branch in Miami-Dade. 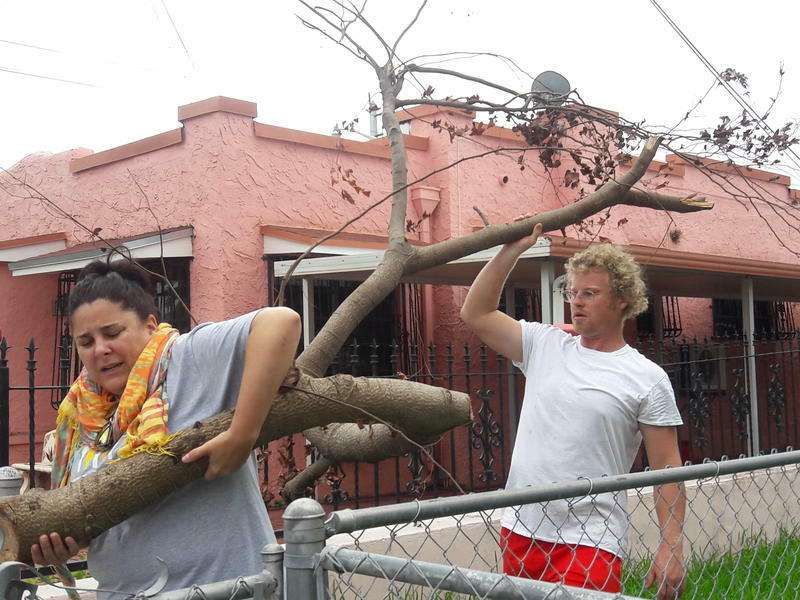 But when WLRN contacted Gloria Guity after the storm, she said it was the first time she’d heard of the program. “I would use it,” she said. When they register, people give details of their special needs. The county assigns them to an appropriate shelter and arranges for transportation, if necessary. Hurricane Evacuation Centers, like Miami Edison, are shelters that serve anyone. These made up the vast majority of shelters opened during Irma. Medical Evacuation Centers have staff from Jackson Memorial Hospital and the health department. They help with things like eating, changing oxygen tanks and treating wounds. For Irma, Sommerhoff said the county opened one of these. Medical Management Facilities, for people who need life-sustaining equipment, are confined to bed or are in critical condition. These are predominantly hospitals. About 2,200 people with special needs were pre-registered before Irma. About the same number — 2,225 people — called the county for help at the last minute, emergency management spokeswoman Erika Benitez said via email. Benitez said the county was unable to shelter all the last-minute callers because buses and first responders providing transportation to shelters cease operations once winds reach tropical storm force. Benitez said it’s unclear how many people ultimately sheltered in place, since some of the callers may have arranged their own transportation to shelters after being told it was too late for emergency management to help them. 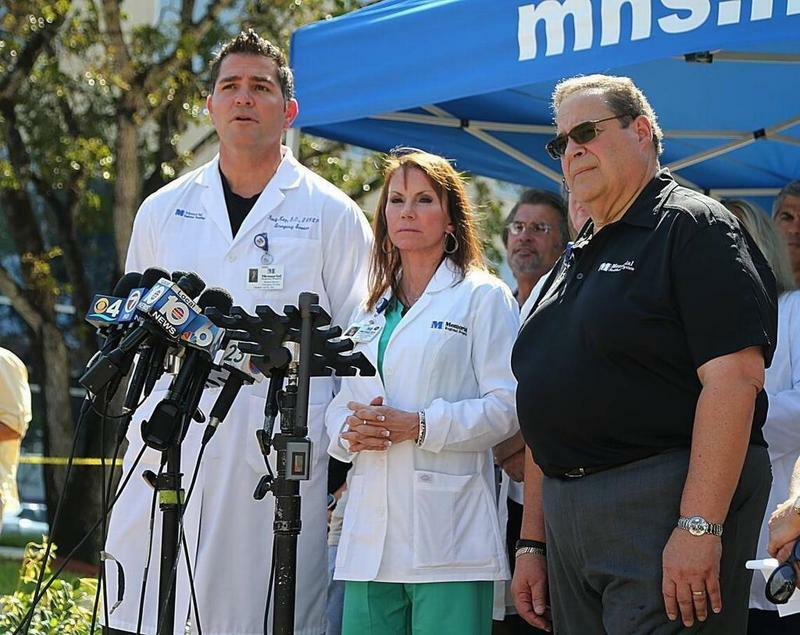 Dr. Joe Scott, chair of emergency medicine at West Kendall Baptist Hospital, says the current evacuation system requires too much of medically vulnerable people: that they know the evacuation assistance program exists, pre-register, and then buy into the necessity of evacuating. 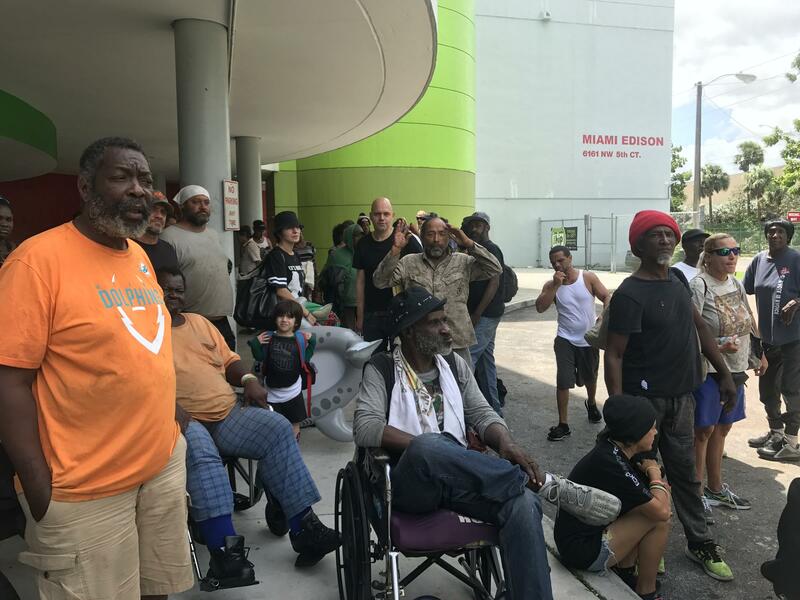 People who evacuated to Miami Edison wait outside the school on Monday, Sept. 11 for buses to return them to their neighborhoods. Special needs evacuees — like all evacuees — are told by the county to have three days’ worth of food and water, bedding and medications; but they may also need to bring medical equipment, service animals and pet supplies, and coordinate preparations and travel with caregivers. Several of the evacuees at Edison said they weren’t able to stock up on food and water because of mobility limitations or because their caregivers had been preoccupied with preparing their own families. Uncertainty or last-minute decisions about what shelters will be open or what areas will be evacuated can enhance those challenges. Miami-Dade Mayor Carlos Gimenez has been criticized for a lack of clarity about which shelters were open when, and said at a Sept. 28 debrief meeting with county commissioners that someone “leaked” a list of shelters to be opened before volunteers were in place — resulting in some evacuees having to wait for hours outside schools serving as shelters. “We need to do a better job with the school board saying, ‘OK, this is the shelter where this group of people are going, this is where this group are going,’” Gimenez said at the meeting. The county is examining its shelter and evacuation procedures as part of a comprehensive review of what worked and what didn’t during Irma. Scott said that as officials review their plans, they need to remember that more elderly people and people with serious conditions are living at home thanks to advances in medical technology. That means instead of automatically spending hurricanes in storm-hardened hospitals, medically vulnerable people have to decide whether, where and how to evacuate. During and after Irma, Scott said, West Kendall Baptist made space for about 40 people who came to the emergency room not for true medical emergencies but because they were running out of medication or needed to plug in nebulizers or refill oxygen tanks and couldn’t or didn’t evacuate to a shelter. Janni Lehrer-Stein, an Obama-era appointee to the National Council on Disability who now is with the national non-profit group Disability Rights Advocates, says clear communication in a variety of different formats is crucial to making sure people with different needs are able to safely evacuate. Lehrer-Stein is blind from a degenerative retinal disease and says her needs are different from someone who’s wheelchair-bound or suffers from psychosis or has developmental delays. "Where are the cots? Where are the blankets? Where's the back-up?" These were some of the questions evacuees at the Miami Edison Senior High School shelter were asking after waiting more than 36 hours for the arrival of Hurricane Irma. Food was running out. One person attempted suicide. And quite a few people left before the storm was over. The following is a collection of dispatches from WLRN reporters staying at shelters in Broward and Miami-Dade counties, which by 6 p.m. on Saturday were hosting almost 45,000 people (15,000 in Broward and more than 29,000 in Miami-Dade), as well as about 1,000 pets. An 11th death has been blamed on the air-conditioning failure at the Rehabilitation Center at Hollywood Hills, which was caused by power outages from last week’s storm. The victim was identified by the Broward Medical Examiner’s Office as 94-year-old Alice Thomas. 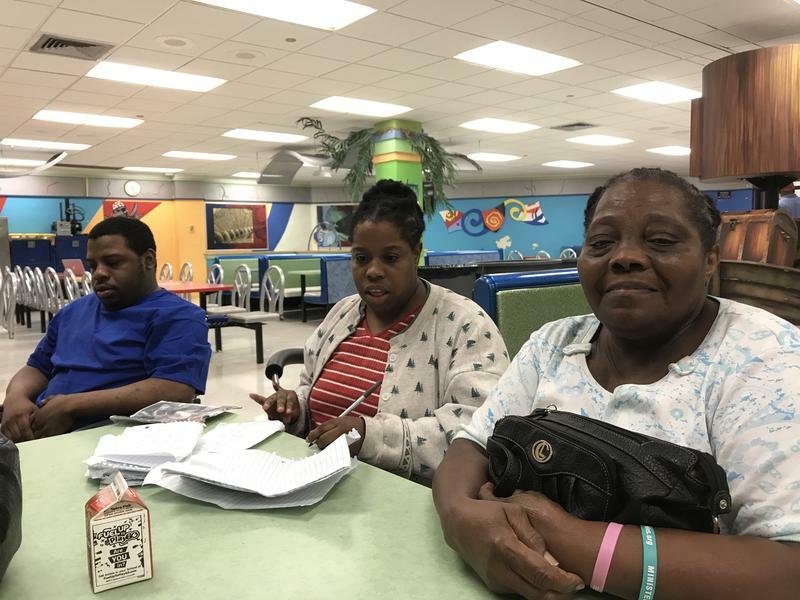 Thomas died on Thursday, eight days after the power failure caused a wave of deaths and forced the evacuation of the nursing home, which is just steps away from Memorial Regional Hospital.